We also provide moisture resistant hand made pure gut strings for the connoisseur. If in doubt order medium gauge. in our main 'shop by category index'. CLASSICAL BANJO STRINGS. LIGHT GAUGE. TIE-ON. 22 - 30. 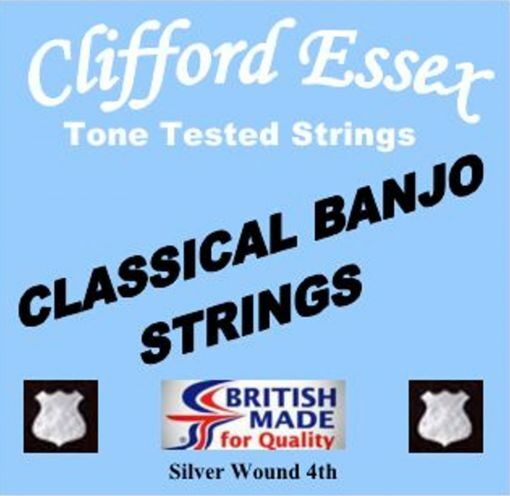 CLIFFORD ESSEX WEAVER BANJO 4th. MEDIUM .028". CLIFFORD ESSEX WEAVER BANJO 4th. HEAVY .030". MINSTREL BANJO STRINGS. TUNED: d. G. D. F#. A.